Like many men diagnosed with prostate cancer, Bill Pickett faced a tough question when he came to UCLA for treatment: how to fight it? Prostate cancer is one of the more curable cancers — it has a 96 percent survival rate 15 years after diagnosis, according to the American Cancer Society. The options men have after a diagnosis have different side effects and trade-offs. So choosing, for example, between radiation therapy or surgery, can be complicated for a person. “When you’re diagnosed with prostate cancer, you realize that each treatment can have very different side effects,” said Pickett, who lives in Los Angeles and came to UCLA for treatment in summer 2016. “You really have to think about what's most important and about which treatment is best for you.” Recent research in the Journal of Clinical Oncology shows that as many as 15 percent of prostate cancer patients later regret their treatment choice. Such difficulties led Dr. Christopher Saigal, vice chair of urology at UCLA, to develop a tool to simplify the choices for men and reduce what he calls “decisional conflict,” when patients experience stress about which treatment — and consequent risks — to choose. The tool, an online computer program called WiserCare, asks men with prostate cancer to answer questions about personal values and goals and based on those answers provides a ranking of suggested treatments. The program works by using algorithms that incorporate medical evidence and modeling to quantify the relative strengths of what a patient says he values. For example, has he answered that having the longest life possible is less important than avoiding a side effect like decreased sexual function? The software then suggests treatment options, which the men can weigh to decide which treatment option is best for them. “As doctors, we want to offer a patient-centered plan that gives patients the power to leverage all the clinical evidence we have and choose a treatment that fits with their personal preferences,” Saigal said. 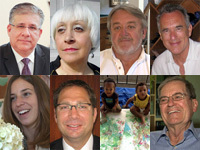 Pickett is one of the more than 300 men at UCLA who have used the tool. It's currently available to all prostate cancer patients at UCLA and is being adopted at a growing number of institutions, including Johns Hopkins and Northshore University. After completing the questionnaire online, Pickett decided that a new clinical trial would be the right choice for him. “By the time I was done using the tool, I knew which treatment I wanted to have,” Pickett said. The trial involved taking oral drugs and subcutaneous injections in hopes of making the surgery to remove the prostate gland — known as a prostatectomy — more successful. Pickett underwent surgery at the end of January and now has no signs of the cancer in his body. He continues to be closely monitored for any cancer recurrence using the prostate-specific antigen test. Prostate cancer is one of many diagnoses that highlights the benefits of personalized medicine. 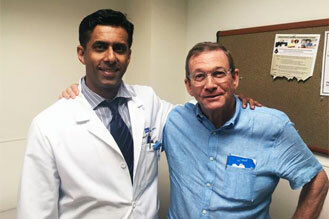 While Pickett, 66, decided a clinical trial followed by a prostatectomy was best for his situation, Saigal said that other men with different preferences choose different treatments. Personalized tools like the one Saigal created aim to give patients the greatest chance at success — whatever that may mean to them. “There is so much data out there now on this diagnosis that patients can be overwhelmed,” Saigal said. “Software programs like these help patients to unlock the power of those data and apply them to their personal situation.” Saigal is measuring the impact of the software on patient decision quality and said his team has found improvements in patient satisfaction, increased knowledge about prostate cancer and reductions in feelings of uncertainty after making a treatment decision. The UCLA Department of Urology provides treatment for urological conditions of all kinds and is committed to providing the highest quality of patient care. We take great pride in being able to share a few of our patients' stories with you. The Department of Urology at UCLA is one of the most progressive and comprehensive urology programs in the country. Our faculty members work side by side with research scientists for new cures and treatments for prostate cancer.